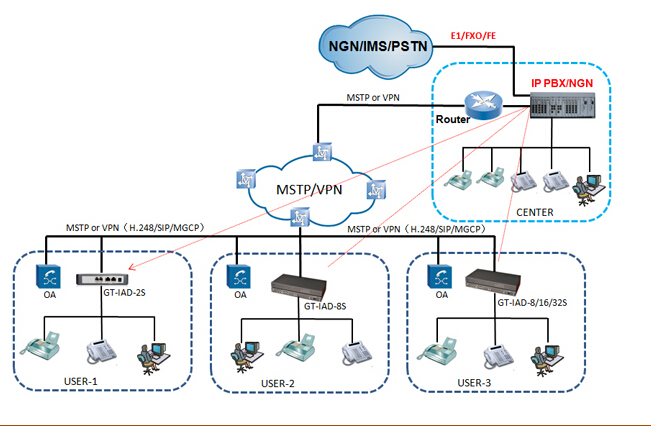 Global Tech Protocol Master(Promaster) GT-IAD-32S/O VoIP Gateway/IAD/ATA is kind of multi analog access equipment. The WAN port can access with IP network and downlink port able to carry with multiple analog telephone. Being user access layer equipment in next NGN network, Promaster GT-IAD series voice access gateway forwards data and voice of end user into Packet Switched Network and accomplish relative functions. GT-IAD-32S/O Series VoIP gateway is 1U,19inch, modular Add and Drop design with pure 32FXS or 32FXO. The equipment have integrated H.248/SIP/MGCP protocol. And user can select protocol VIA WEB browser. It can also support customized function development like H.248 protocol with internal call and PSTN Lifeline.